His Holiness the 14th Dalai Lama, Tenzin Gyatso, the Buddhist leader of the Tibetan people, is one of the most revered spiritual masters of our time. His books are popular with seekers of all traditions for their blend of inspirational messages and down-to-earth practices. He walks the talk of peace and love, urging us to recognize kindness and compassion as the core of all the world's religions. 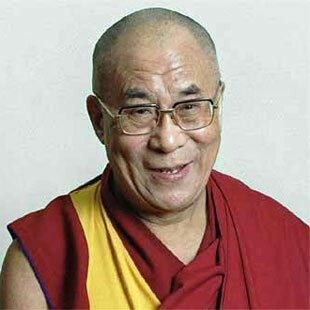 In 1989, His Holiness the Dalai Lama received the Nobel Peace Prize for his consistent use of nonviolence and his advocacy of peaceful solutions based upon tolerance and mutual respect. He combines an emphasis on justice and ethics with a multidimensional understanding of the human psyche and the universal yearning for happiness. In this 40-part e-mail course, we ponder the Tibetan Buddhist wisdom that animates his teachings on the art of happiness, the power of forgiveness, the path to tranquility, seeing enemies as teachers, living ethically, taming the mind, and much more. Each email contains a brief passage from the Dalai Lama's writings and a suggestion of a simple way to bring that wisdom into daily life. His Holiness the Dalai Lama is convinced that each and every moment of the day is an opportunity to practice.